The desire to see that scientific invention is sustainable enough to serve generations after us is precisely E-Terra’s soul. A popular indigenous proverb says ‘we do not inherit the earth from our ancestors; we borrow it from our children’. 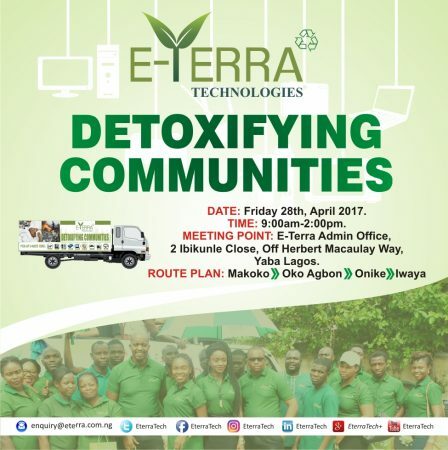 E-Terra Technologies is an eco-friendly waste management company that is medicating Nigeria’s electronic waste (or e-waste) crisis with technological innovation, community engagement and an incentivised e-waste recycling initiative. Her business model, built upon marrying technological advancement with sustainability strategies, is designed to solve identified needs within an ecosystem cohabited by grassroots communities and corporate bodies. 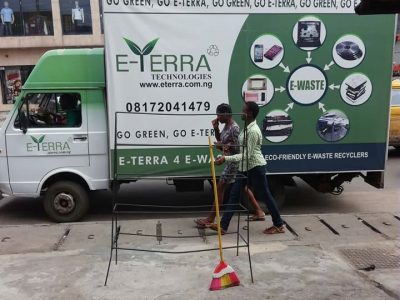 In many ways, E-Terra is even emerging as a most trusted connector between these two economic strata. In line with best international practice, the brand has proven itself as exemplary to innovating data security within corporate corridors as to the vital sensitising and systematic education of grassroots communities. In order to truly appreciate the relevance of her glorious existence to our environment today, it is important to understand the genesis and evolution of the global e-waste problem. Technological devices such as computers, servers, printers, tablets and phones are great. They have significantly improved our world and the way we do business. Much so that many lives and businesses would instantly become dysfunctional without them. 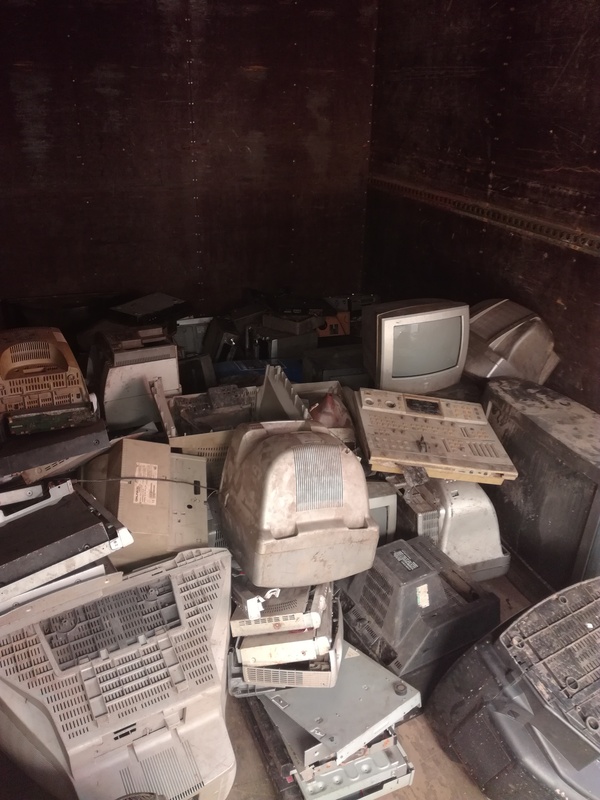 Unfortunately as these devices become obsolete due to consistent advancement in technology, or unwanted due to electronics consumerism; obsolete ones become hazardous e-waste with ensuing disposal and data protection becoming a growing concern. According to the United Nations Environmental Programme (UNEP), over 70% of e-waste is stored in offices and residences, with owners ignorant of the toxicity of such items. A publication in Guardian (2015) also revealed that over 200,000 cancer cases are diagnosed every year in Nigeria, while 10,000 people die annually (10 people every hour) from same. 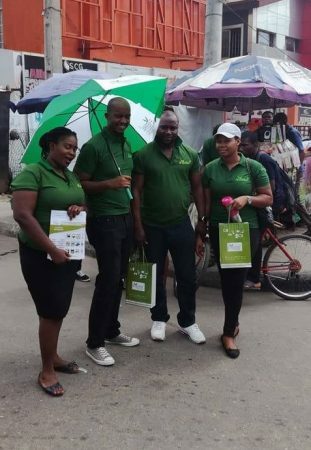 UNEP links the alarming cancer, kidney and liver diseases in Nigeria to environmental pollution mainly due to industrialization and the improper disposal of e-waste. 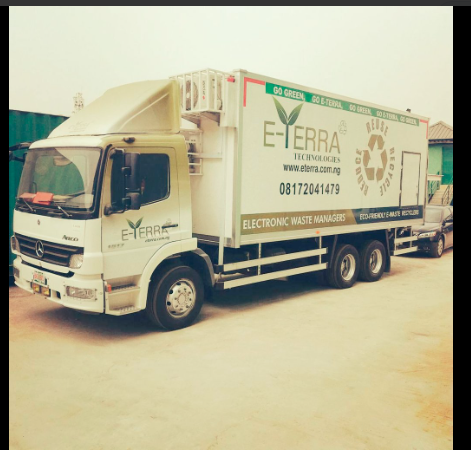 An E-Terra State-of-the-art Mobile Data Destruction Truck (first of its kind in West Africa). 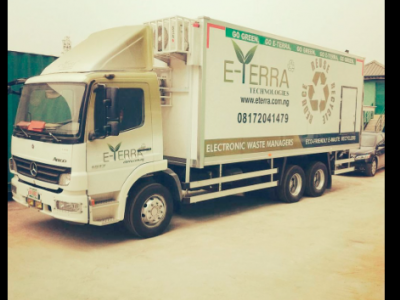 An E-Terra Branded E-waste Collection Truck. In Nigeria, the burden of accommodating e-waste is fuelled not just by locally generated e-waste but by the shipment of e-waste from the developed world to local landfills that serve as dumpsites. Nigeria and Ghana are in fact Africa’s prime spots for electronic dumping. 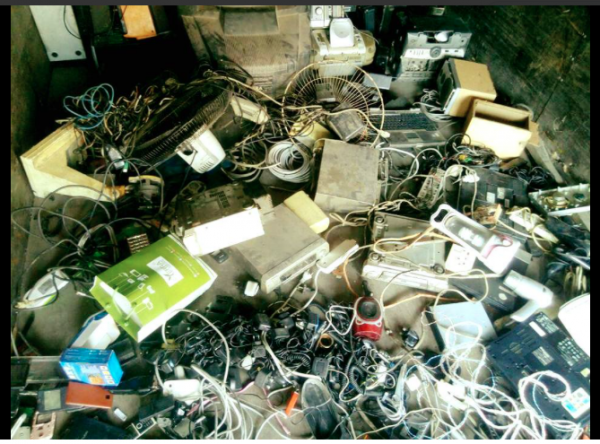 Everyday, the port city of Lagos receives an estimated 15 shipping containers filled with discarded electronics that end up at landfills, for urban mining. To the state government, the immediate implications are the overbearing costs of securing large expanses of land for installing landfills; and then the added costs of maintenance. As landfills pile high, they become a gross environmental scar that need urgent medication. Their volume must be reduced and the usual treatment is to burn them in open fields, even though this could release toxic, cancerous carbon emissions (of mercury, lead, chromium and cadmium to name a few) into the air and larger ecosystem. What’s more, informal handlers hammering and chipping away at scrap electronics do so at the risk of their personal and environmental health. Their activities also do not solve the landfill volume problem. The truth is, where a landfill contains waste items that are not biodegradable in addition to being hyper toxic, the band aid of burning really just exacerbates what is an already existing and festering environmental problem by fabricating a mask system that shuns the responsibility to educate the public about two pressing dangers which are improper disposal of electronics and device data security. Device data security also has reached critical point. But its needs are interlinked with those of environmental sustenance. Landfills are a prime location for informal data recovery handlers looking to retrieve valuable information from discarded hard drives. According to Computing Magazine 2015, the surest way to stop criminals stealing data from obsolete electronic waste e.g. computers is to degauss and destroy the hard drive and other storage devices. The magazine highlighted a fraud incidence of 22,000 “deleted” files discovered from eight computers, which it bought from the auction site eBay – demonstrating normal deletion, formatting and degaussing is insufficient to remove data from hard drives. This is worrying information considering the drought of reputable data destruction companies in Nigeria. Educating and sensitising the public towards e-waste management needs and solutions are responsibilities that should be taken up by all, regardless of economic strata, tribe, religion, gender or sociopolitical affiliation. Everyone after all is an electronics consumer and a stakeholder in the environment. 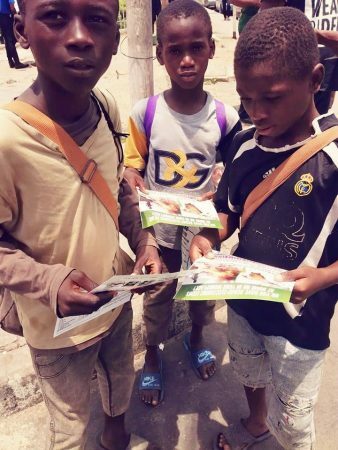 School Kids holding E-Terra handbills, learning about electronics and recycling. 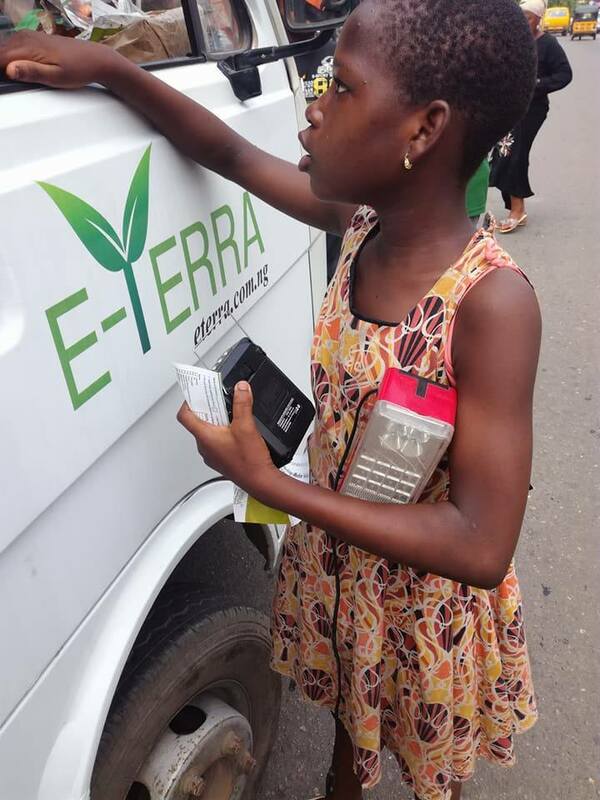 Kids are aiding in the detoxifying of their communities by partnering with E-Terra. One coveted attribute of E-Terra Technologies, is that creating awareness on e-waste hazards ranks highly on her engagements list. As a matter of fact, this novel and niche business cannot achieve any sales conversion without a sensitised buying public. 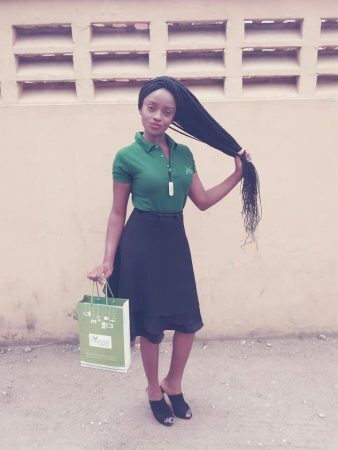 To this marketing end, she runs regular and costly mass communication campaigns like radio jingles, T.V commercials, BRT bus ads, billboards, presentation workshops and the likes to create public awareness. This labour is the cross that comes with pioneering an emerging market. It is a leadership cross that E-Terra must gladly carry. 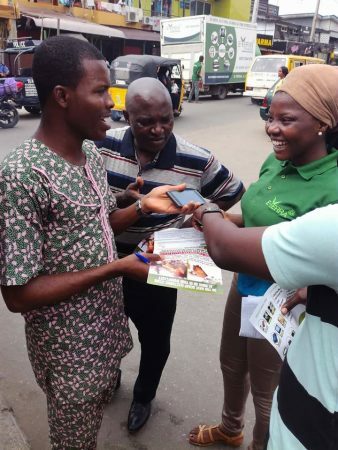 To market her ministry even more engagingly, she hosts regular sensitising road shows where educative handbills are disbursed to engage residential communities, faith-based groups, students, labour unions and corporate associations, with e-waste management talking points. In order to accelerate collection prospects, an incentivised model is run, based on rewarding with money and other prize rewards, individuals and groups at the grassroots who gather and hand over their e-waste to E-Terra Technologies. This incentivised collection scheme is applicable to only one of her core services however: E-waste Collection and Eco-friendly Disposal. It is what can be referred to as a tailored social benefit system, which strengthens the fabric of a broader business model that caters to multiple core services. The E-Terra story warrants recognition for various identified reasons. 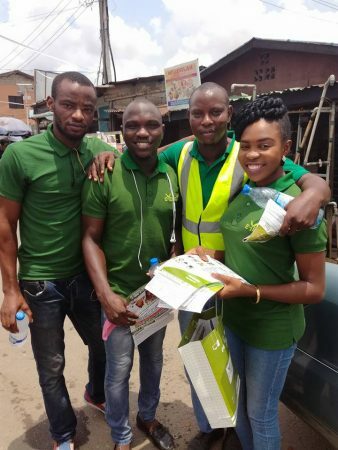 She is a waste management company tackling head-on, the fastest growing waste stream in the world today. E-waste is also the most toxic waste found in our landfills. 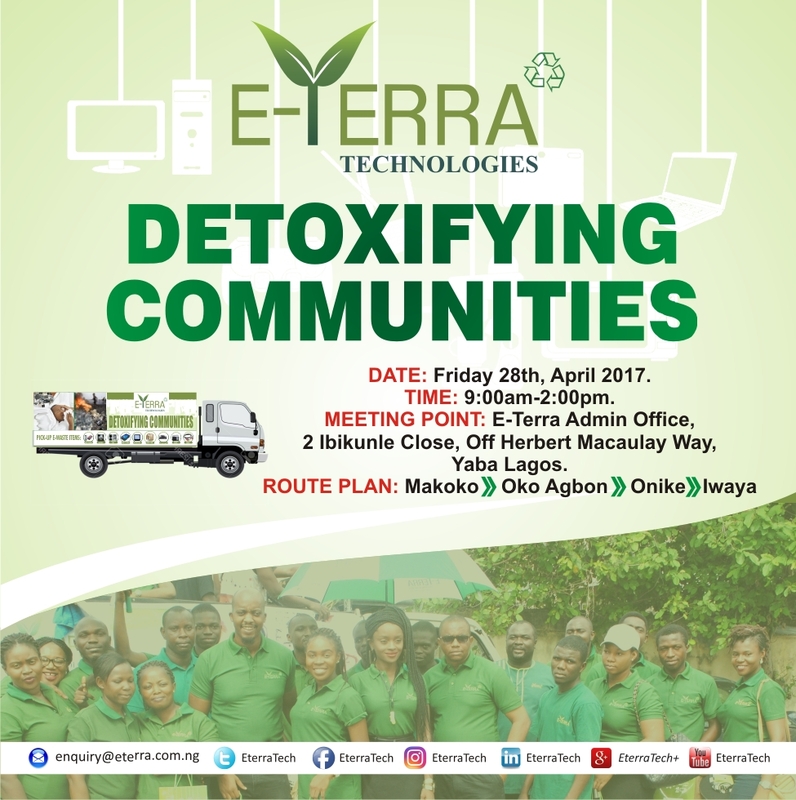 What is even more interesting is that E-Terra is gallantly detoxifying our public space as a hundred per cent privately funded company! Private sector enterprise at its finest, to say the least. She is youth-founded and youth-run, which is a wealth of raw inspiration for any emerging market or society at large. Her glass didn’t start out half full however. During her early days, the company was started up from the CEO’s salary and severance pay, from his previous job as the team that developed and opened Starwood’s Four Points by Sheraton Hotel, Lagos. Operations then at E-Terra Technologies Ltd, were small-scale and revolved primarily around repairing damaged electronics. Repair works were conducted in poorly built work sheds against the backdrop of substantial struggle. But the CEO was armed with two assets: raw ambition and an essence rooted in humanity. An essential part of the dream was to own a Material Recovery Facility that would recycle obsolete electronics. Raising capital for that venture truthfully, would require some track record and most importantly strength of character. With time and sheer hard work, financial cushioning streamed in via multiple angel investors. E-Terra Truck Floor Covered in Collected E-Waste. Fast track three years later today, E-Terra runs an administrative office at a central location in Yaba, Lagos and owns a Material Recovery Facility (MRF) plant in Abule Ado, Lagos. From this MRF plant, she recycles collected e-waste safely and securely, utilising international best practices. 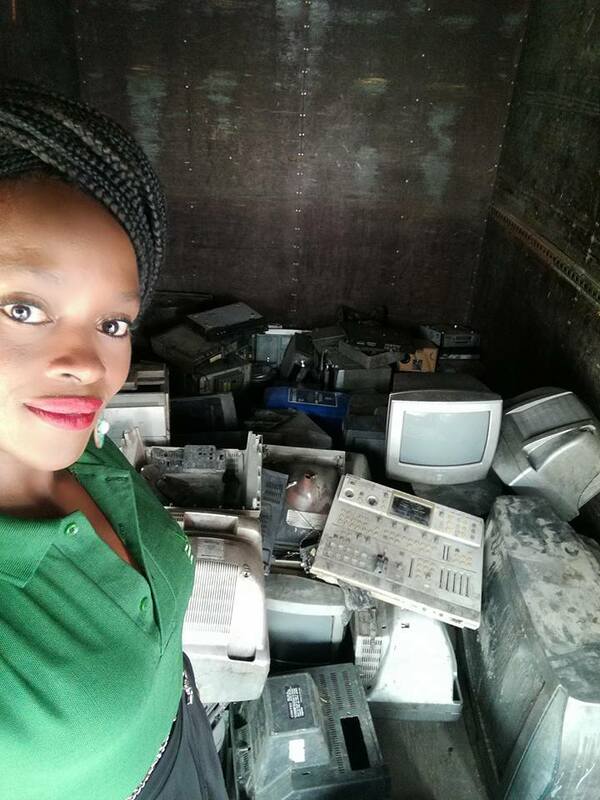 Her core services have been developed to include E-Waste Collection and Eco-friendly Disposal, Data Destruction, IT Asset Decommissioning, and Refurbishing. E-Terra has acquired all licenses required to run business locally. On the international field, she is ISO certified on both 9001 and 14001 standards. Both certifications mean she is recognised internationally for the quality of her maintained standards both as an operating business and as an environmental management outfit. She is a predestined shining star being unraveled in the Nigerian geography. The people who buy into her pioneering brand tend to do so because of her proven track record to date, and the magnanimity of her dreams and company vision. These people have a similar vision as her. They are environmentally-conscious. They tend to be pioneer-inclined, and confidently advocate technological advancement not just in Africa but universally. 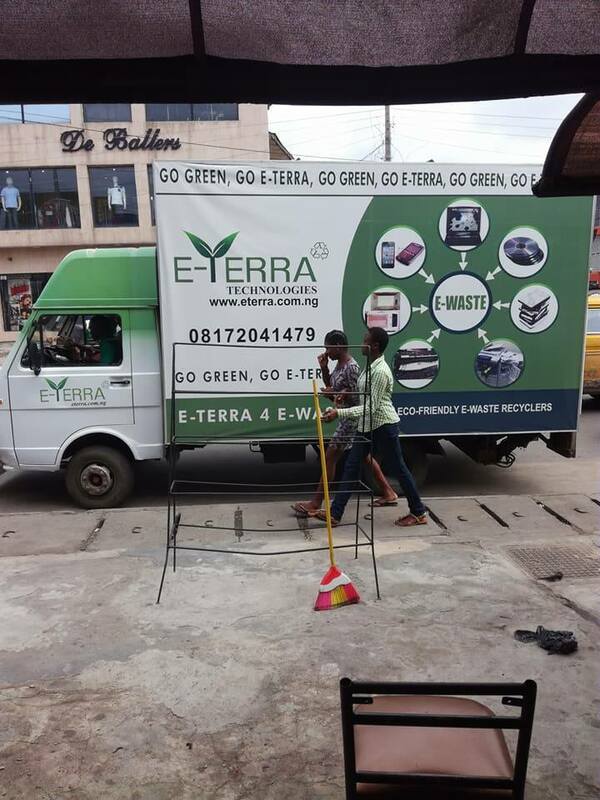 E-Terra is an enterprise but because the company prides on being a wealth creator, she envisages and so much as engineers, a budding social space that is a win-win for all who promote e-waste management both at grass roots communities and at the corporate level. 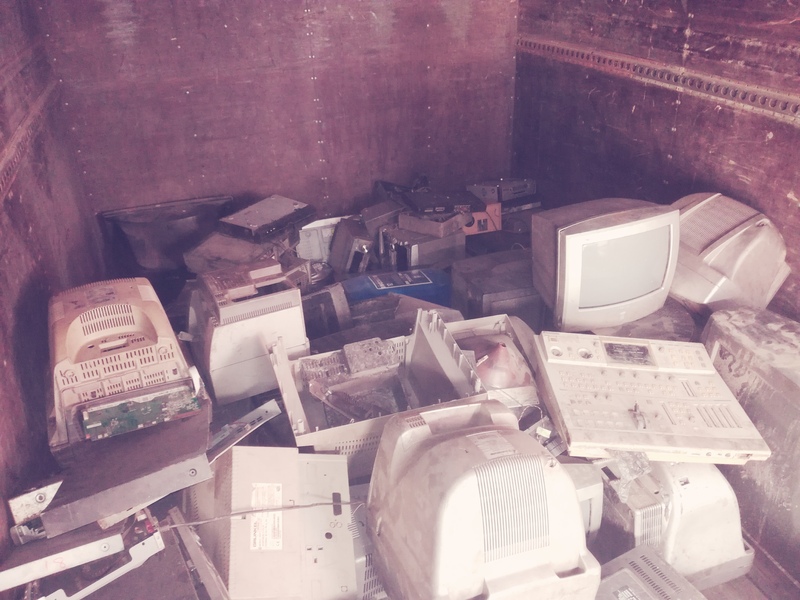 To these ends, various community and corporate initiatives are run, which serve to reward responsible e-waste management advocacy and to actualise Corporate Social Responsibility (CSR) across sectors. E-waste of course deserves all the attention it can get. It is a narrow path. Managing e-waste is a lot more cumbersome than general waste, by copious miles, financially and operationally. 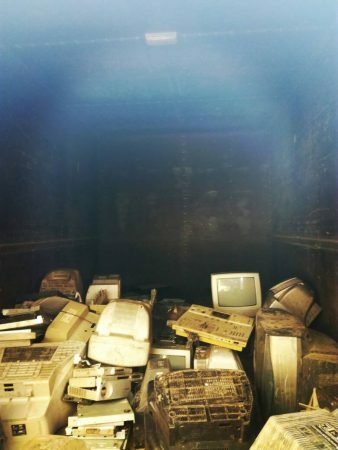 In part, the technology required for safe and secure recycling is costly; temperate storage facility required when managing e-waste is also a luxury. Hot temperatures cause stored e-waste to secrete carbon emissions faster (increasing management costs), while a lack of sufficient power supply to cool stored e-waste alludes to constant usage of generators which also escalates running costs. Not for the faint-hearted, e-waste storage (and more broadly, management) is a vicious cycle that is costly on all fronts. E-waste in itself being toxic, should be stored temporarily and quickly discarded in an eco-friendly manner that is not harmful to humans and the environment. Prior to disposal of obsolete electronics, sensitive proprietary information must be saved and the storage media destroyed to prevent violation of privacy and confidentiality. 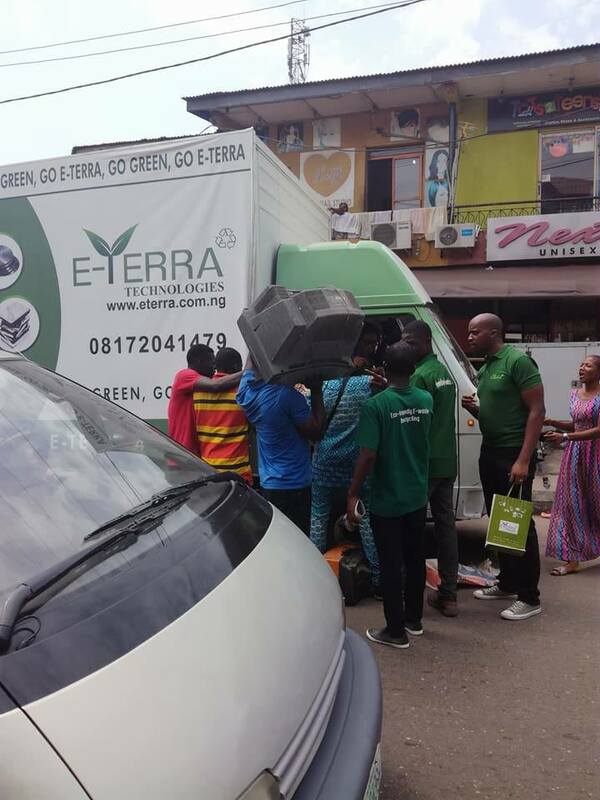 E-Terra ameliorates this data security danger with data destruction facilities, one of which is a state-of-the art mobile data destruction truck (see image at top of article) that is indeed the first of its kind in West Africa and enables the provision of hard drive shredding and data destruction services at clients’ convenience. This convenience value proposition on sensitive data, directly medicates crucial corporate factors supplementing the e-waste crisis. Conclusively, growing electronic waste symbolises a widening scar. Toxic carbon emissions stretch out their footprints on the map of our ecosystem because of a deep-seated rot which primarily is the improper disposal of accumulated e-waste. 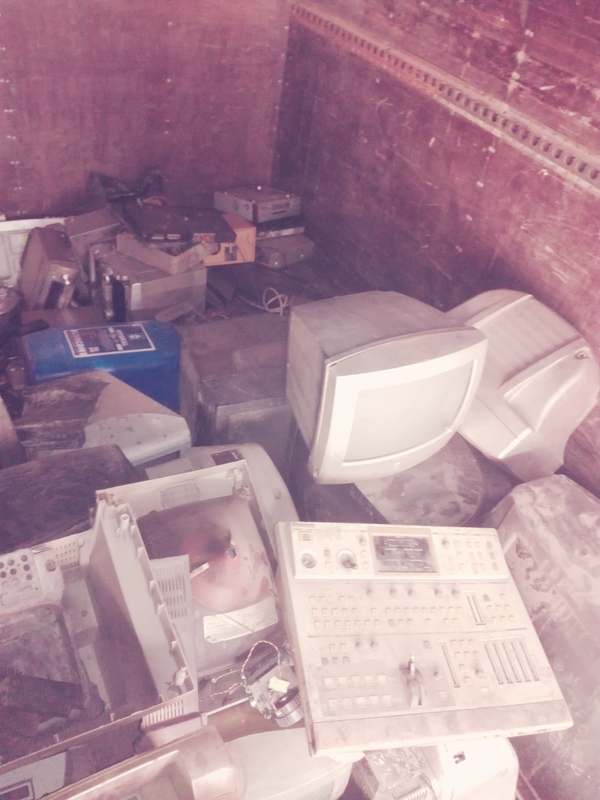 Two ensuing concerns from growing e-waste are eco-friendly disposal and data security. E-Terra Technologies Ltd gallantly engages this crisis by setting itself as a benchmark organization embracing international best practice and innovative solutions dealing with e-waste issues. 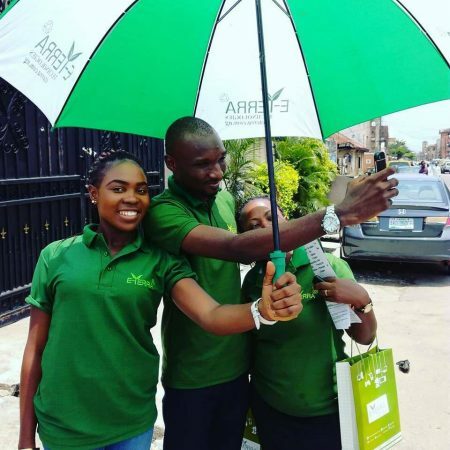 Against all odds, this company has initiated something new in Nigeria that incorporates best international practices in industry, optimizes human development and has the potential to outlive us for generations to come. What a thrill! Sustainability is her soul. 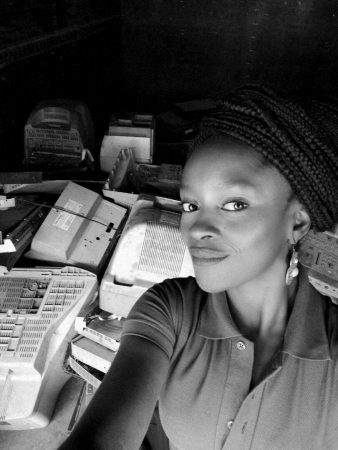 She is the first data degaussing and shredding company in Nigeria and is in fact the flagship name for e-waste recycling in all of Africa, with state of the art technology! She has benchmarked her standards so high that there isn’t an environmental management outfit in her immediate region with comparable vision, accreditation and capacity. And there will not be for a very long time to come. It is all well and good to go where none has dared, but it is better to discover vast opportunities for bridging markets and growing economies; and to continue to challenge the self vigorously on such a pioneering journey. This ambition is a reality the E-Terra brand can lay claim to. That her soaring soul thrives ever so brilliantly at such quality standards, is her story. what UNEP study was quoted for the correlation between cancer growth rate and improper disposal of e-waste? UNEP and WHO further confirmed alarming death rates (6.5 million per year) linked to industrialisation and air pollution. 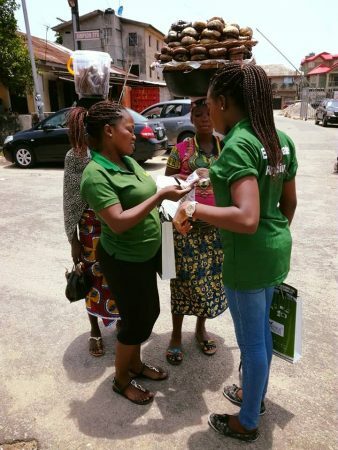 http://www.environewsnigeria.com/wmo-unep-join-forces-health-environment/ Our posted article draws attention to the fact that burning landfills and the lack of any existing e-waste collection framework that utilises best international practice exacerbates the toxic landfill hence air pollution crisis.